After three glorious weeks in the Sunshine State with my feisty and lovely mother in law, I had one of those miserable weeks: a wisdom tooth pulled, followed by a migraine and COLD!!! While I can wallow in misery with the best (and believe me, I did…), the power of comforting kitchen therapy beckoned me. I could barely open my mouth, let alone chew (sorry, TMI?) and I wanted my Mommy!! Since she is about six thousand miles away - all I can do is channel her and her cooking, of course! For some mysterious reason, when I feel energized - I cook and when I am down - I bake! So, I was craving my mother’s Marble Cake: pillowy, tender vanilla cake streaked with chocolatey streams, that needs only a simple dusting of powdered sugar to dress it up. 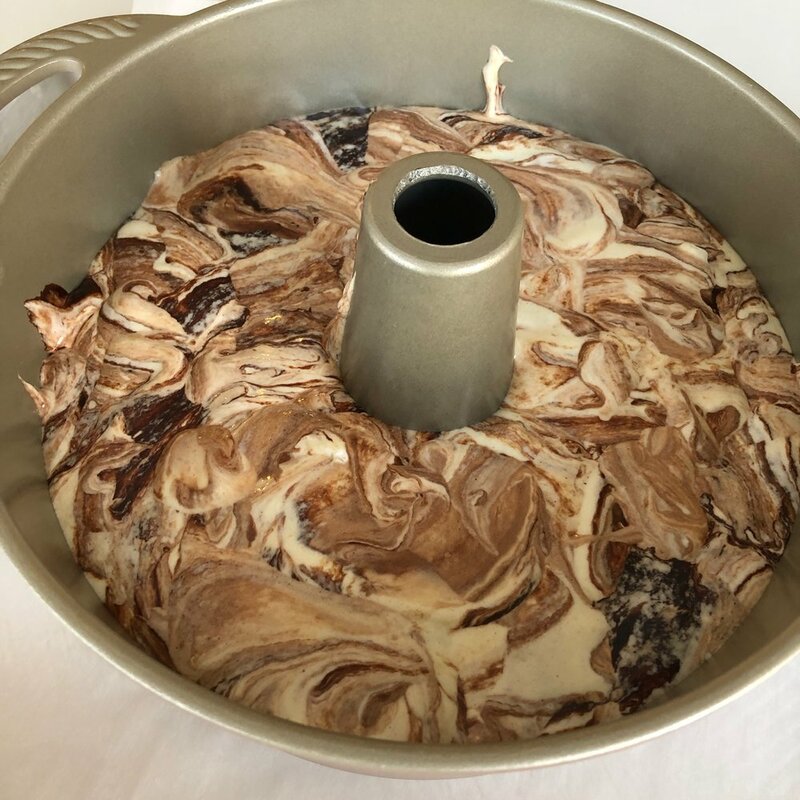 My Mom was not reachable in Israel, so I dove into the internet vortex to find an Israeli marble cake recipe. The first one that appealed to me featured a picture and method that promised a tall, light and flavorful cake with minimum labor… No separating of eggs, all in one bowl… as we say in Israel: Chik- Chuck! I should have known better! Below is the result; definitely NOT light OR tall but dense and gummy. Major let down! I used my beautiful Nordic Ware Tube Pan* and the cake rose beautifully, plus it detached easily from the pan - even though the recipe requires not greasing it! Highly recommended!! So here it is: the Israeli recipe - converted and adapted to the American kitchen! Thank you Carine! Let me know when you make it (not if!!) and check out Carine’s book available on Amazon!